This article originally appeared at Mobility Lab. What would happen to congested urban traffic if some trips could simply be picked up and moved into the air? That’s a question players from Uber to Airbus to NASA are seriously studying. But to Bruce Gunter, who often has to take unnecessarily long car trips from his home in Virginia Beach to Richmond to visit family, some of the pieces of this “on-demand urban air transportation” puzzle are missing. “I’m frustrated because most of the research is being done in California and there’s nothing in Virginia along the Interstate 95 corridor. It’s almost comical because almost all the work is being done by NASA [from its offices in] Langley, Va.,” Gunter laughed. Gunter has more than a passing interest in what can no doubt be simply referred to as flying cars. He is managing director of Veetle, a company that is producing these VTOLs (vertical take-off and landing vehicles). But he also has deep knowledge of lengthy Federal Aviation Administration processes, especially from his days working at Cirrus, which has gotten extensive news coverage about its parachute-deploying small planes. Daily long-distance commutes in heavily congested urban and suburban areas and routes under-served by existing infrastructure will be the first use cases for urban VTOLs. VTOLs will have greatest appeal for those traveling longer distances and durations [and] a small number of vertiports could absorb a large share of demand from long-distance commuters since the “last mile” ground transportation component will be small relative to the much longer commute distance. Along Virginia’s stretch of I-95 or in other congested nearby cities like Richmond, Virginia Beach, and Washington, D.C., flying cars could certainly be an option worth exploring. 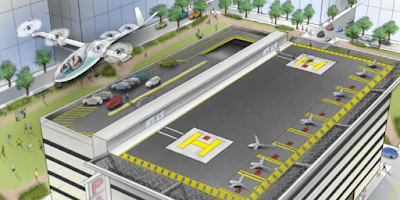 “This could broaden the scope of how people get around, even more than what Uber has shown us already with cars,” Gunter said, adding that passengers would reserve a plane just like an Uber, but would instead, unlike an Uber, head to a designated rooftop to jump in. Some of the bigger keys, besides simply getting the public to change long-ingrained travel habits and developing policy guidelines, include making trips inexpensive, reliable, and shared in the sense so they would be more like transit than personal vehicles. In the long-term, VTOLs will be an affordable form of daily transportation for the masses, even less expensive than owning a car. Normally, people think of flying as an expensive and infrequent form of travel, but that is largely due to the low production volume manufacturing of today’s aircraft. The economics of manufacturing VTOLs will become more akin to automobiles than aircraft. Initially, of course, VTOL vehicles are likely to be very expensive, but because the ridesharing model amortizes the vehicle cost efficiently over paid trips, the high cost should not end up being prohibitive to getting started. Another matter is whether the vehicles would create noise and air pollution. Gunter said the battery technology is still at least a decade away to make them powered fully by electric propulsion. Until then, they would need to be “some kind of hybrid” of gas and electric. But he added that the noise would be minimal because they would operate somewhat like drones, which the public already largely understands as being relatively quiet. Also, would we simply be displacing traffic jams on the roads for ones in the sky? “I’ve got 6,500 hours of flying and, in my experience, it’s rare if you ever see another airplane. If you do, it’s near the big airports by places like New York and Atlanta,” Gunter said, adding that VTOL traffic is mainly a matter of being managed effectively. As science-fiction-y as it seems, we may indeed be hearing more about on-demand urban air transportation soon. Uber is sponsoring an invitation-only conference April 25-27 in Dallas.